Micrograph showing a cluster of Leydig cells (center of image). H&E stain. Leydig cells, also known as interstitial cells of Leydig, are found adjacent to the seminiferous tubules in the testicle. They produce testosterone in the presence of luteinizing hormone (LH). Leydig cells are polyhedral in shape, display a large prominent nucleus, an eosinophilic cytoplasm and numerous lipid-filled vesicles. The mammalian Leydig cell is a polyhedral epithelioid cell with a single eccentrically located ovoid nucleus. The nucleus contains one to three prominent nucleoli and large amounts of dark-staining peripheral heterochromatin. The acidophilic cytoplasm usually contains numerous membrane-bound lipid droplets and large amounts of smooth endoplasmic reticulum (SER). Besides the obvious abundance of SER with scattered patches of rough endoplasmic reticulum, several mitochondria are also prominent within the cytoplasm. Frequently, lipofuscin pigment and rod-shaped crystal-like structures 3 to 20 micrometres in diameter (Reinke crystals) are found. These inclusions have no known function, are found in less than half of all Leydig cell tumors, but serve to clinch the diagnosis of a Leydig cell tumor. No other interstitial cell within the testes has a nucleus or cytoplasm with these characteristics, making identification relatively easy. 'Adult'-type Leydig cells differentiate in the post-natal testis and are quiescent until puberty. 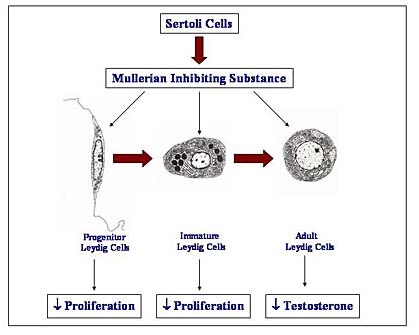 They are preceded in the testis by a population of 'fetal'-type Leydig cells from the 8th to the 20th week of gestation, which produce enough testosterone for masculinisation of a male fetus. Leydig cells release a class of hormones called androgens (19-carbon steroids). They secrete testosterone, androstenedione and dehydroepiandrosterone (DHEA), when stimulated by the pituitary hormone luteinizing hormone (LH). LH increases cholesterol desmolase activity (an enzyme associated with the conversion of cholesterol to pregnenolone), leading to testosterone synthesis and secretion by Leydig cells. Prolactin (PRL) increases the response of Leydig cells to LH by increasing the number of LH receptors expressed on Leydig cells. Micrograph of a Leydig cell tumour. H&E stain. Leydig cells may grow uncontrollably and form a Leydig cell tumour. These tumours are usually benign. They may be hormonally active, i.e. secrete testosterone. Adrenomyeloneuropathy is another example of a disease affecting the Leydig cell: the patient's testosterone may fall despite higher-than-normal levels of LH and follicle-stimulating hormone (FSH). Lateral electrical surface stimulation therapy has been found to cause proliferation of Leydig cells in Rabbits. Leydig cells are named after the German anatomist Franz Leydig, who discovered them in 1850. 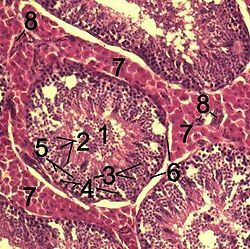 Section of a genital cord of the testis of a human embryo 3.5 cm long. Intermediate magnification micrograph of a Leydig cell tumour. H&E stain. High magnification micrograph of a Leydig cell tumour. H&E stain. Cross-section of seminiferous tubules. Arrows indicate location of Leydig cells. ^ Al-Agha O, Axiotis C (2007). "An in-depth look at Leydig cell tumor of the testis". Arch Pathol Lab Med. 131 (2): 311–7. doi:10.1043/1543-2165(2007)131[311:AILALC]2.0.CO;2 (inactive 2019-02-17). PMID 17284120. ^ Ramnani, Dharam M (2010-06-11). "Leydig Cell Tumor : Reinke's Crystalloids". Retrieved 2011-11-06. ^ Svechnikov K, Landreh L, Weisser J, Izzo G, Colón E, Svechnikova I, Söder O (2010). "Origin, development and regulation of human Leydig cells". Horm Res Paediatr. 73 (2): 93–101. doi:10.1159/000277141. PMID 20190545. ^ Bomba G, Kowalski IM, Szarek J, Zarzycki D, Pawlicki R (2001). "The effect of spinal electrostimulation on the testicular structure in rabbit". Med Sci Monit. 7 (3): 363–8. PMID 11386010. ^ synd/625 at Who Named It? This page was last edited on 9 March 2019, at 08:08 (UTC).